My dad wasn’t around when I was growing up, and my stepdad…Well, let’s just say he chose to show his affection primarily with his fists. So the male/fatherly role is something I don’t have a lot of positive experience with, and it’s something that I look to Dorian for cues, guidance, and support. This also is true of our marriage because again, I didn’t have the best examples to study and learn from during my upbringing (but I’ll save that for a later post). It got me to thinking about my relationship with my mom. Although I am grown now, my mom still puckers up and expects me to kiss her on the lips whenever we see each other, which I don’t mind because I’m just used to it, I guess. Perhaps it’s just a cultural thing. 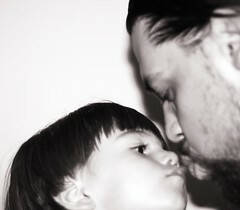 Do you think it’s okay to kiss your child on the lips? Why or why not? Let me know, leave a comment below! Read the original post on BabyCenter’s blog here.